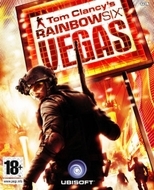 Rainbow Six: Vegas presents a new team of Rainbow Warriors, as they take to the streets of Las Vegas. An escalating terrorist siege in "Sin City" threatens to take world terrorism to new, uncontrollable heights. Real-time Immersion – real-time mission briefings in the midst of the most intense combat ever played.